Stretched and framed, marker on canvas. Split imagery of life in coal mine and world above. 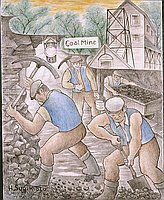 One man shovels coal, right foreground, while another raises a pickaxe above coal in wall on left. 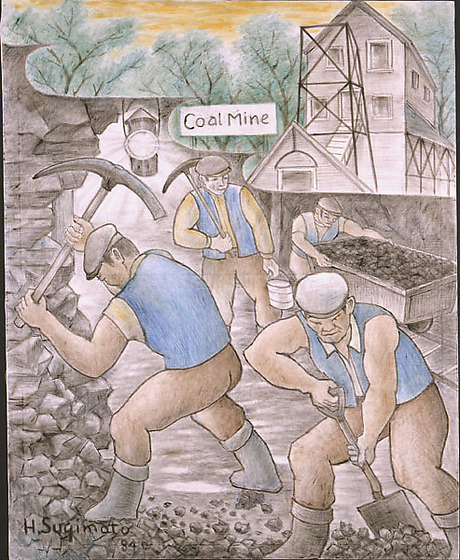 Behind them one man pushes a coal bin on tracks, right midground, as a man walks with a pickaxe and bucket in tunnel. All men are dressed in brown pants, black boots, cap and blue vest over tan shirt. A lamp shines light from above. At top, cloud-like image of trees and coal mill with sign, "Coal Mine," under sunny sky.